PLEASE NOTE THAT ALL FUTURE EXHIBITIONS HELD AT THE OLD FIRE STATION GALLERY WE NO LONGER BE ON THE TOWN COUNCIL WEBSITE. Welcome to our website page for the Old Fire Station Gallery, a converted fire station providing a magnificent gallery for artists to display their paintings, sculptures, tapestries and photography. 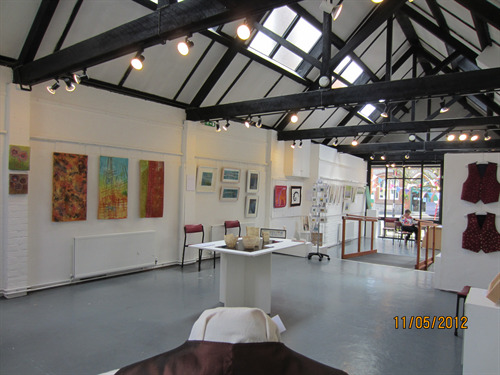 The Gallery can be hired on a weekly basis. If you would like to hire this space please click here to download our booking form. The form is in 'word' format so you can complete and return it to us by email. Please return the form as a word document to l.clark@henleytowncouncil.gov.uk, accompanied by any jpeg images you wish to accompany your information to be shown below. The same information will be added to our sister 'What's On' website. Please contact our information centre to check availability. Note that the Old Fire Station Gallery can be hired for half price in January and February each year. This means if you are a local organisation or resident you can hire the facility for just £132.50 per week, or £150.00 per week if you are a non-local hirer. Local landscape painting in oils from posrcard sized to 100cm. ..........just who is the real Steve Allender? Exhibition of Paintings by Will Mackenzie - "Upstream and Downstream"
Will Mackenzie's paintings include "Henley Scenes" (Temple Island, Henley Lock and others), scenes from the River Lee in North-East London and other scenes and subjects, with an emphasis on waterside vistas. Will paints in a vivid dynamic style, using oils on canvas or board. Brought up in Medmenham, Buckinghamshire, Will Mackenzie attended Sir William Borlase's Grammer School, before studying Biochemistry at Manchester University. Will qualified as a solicitor and is with the Government Legal Service. Will took up paining in 2014 under the tuition of Hugh Mendes. Will has exhibited in a number of galleries. This is his fourth solo exhibition. This selling exhibition of painting, sculpture and craft by Guild members launches Henley Arts Trail (HAT 2019) and lasts for 2 weeks running up to and including the HAT weekend. The Guild is Venue 1 on the Trail. For further information about the Guild and our exhibitions please visit www.henley-art-crafts-guild.org or look at our Facebook page - Henley Arts and Crafts Guild.